Manchester Airport’s Terminal 3 was evacuated on Wednesday morning after a suspicious bag caused a security alert. Armed police and bomb disposal officers attended the scene. Flights are experiencing major delays. After a series of controlled explosions were carried out of the package, Greater Manchester Police said the device was not "viable" or terror-related. “Following further inspections, the package is not believed to be a viable device and there is not believed to be any threat at this time," the force said in a statement. “This is not believed to be terror related and cordons will be lifted in due course." Staff and passengers are now being allowed back into Terminal 3. Footage has emerged of passengers being evacuated. Sirens now from emergency vehicles at #Manchester airport. Passengers had been taken off planes and buses. However, flights continued to land at Terminal 1 and 2. Due to a potential issue with a bag in Terminal Three, a precautionary evacuation is taking place while further investigations take place. “Police were called at 8.50am [BST] on Wednesday 5 July 2017 to reports of a suspicious package at Manchester Airport,” the force said in a statement. “Officers are responding and a precautionary evacuation of terminal three is taking place. 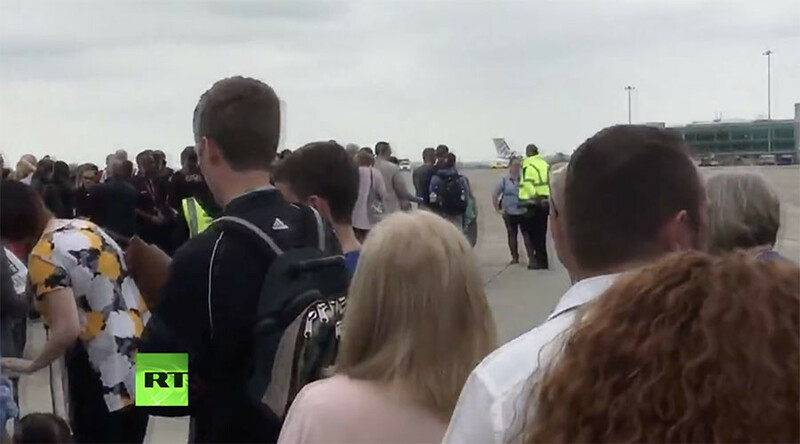 It follows a separate evacuation at Britain’s third busiest airport on Tuesday caused by a water leak. Passengers were told to leave some areas as water could be seen pouring through the roof.